Regular vehicle maintenance includes checking your tire pressure, and while it's one of the easier maintenance items, for some reason it's often overlooked. But ignoring this one can cost you more at the gas pump, more at the tire shop, and increases the risk of a tire blowout, which is always inconvenient and often dangerous. According to the Department of Transportation, an additional five million gallons of fuel are used every day in the U.S. due to low tire pressure. That's over two billion gallons annually - a tremendous waste that's completely preventable with proper tire maintenance. Tire pressure changes with seasonal temperature variations and other factors, so make it a habit to check your tire pressure once a month. Don't wait until you can see a tire is underinflated. If it's visibly low on air, it's REALLY underinflated and should be inflated immediately before taking to the road. 1. Use a good quality gauge that provides an accurate reading - preferably a digital one. 2. Be sure of the recommended tire pressure for your car. It's listed in the owner's manual and on the driver's door edge. Look for a number followed by 'psi,' which stands for 'pounds per square inch. 3. 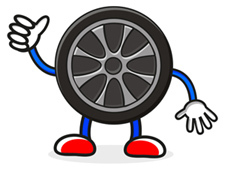 Be sure to check pressure when tires are cold - not right after the car has been driven. It takes about half an hour for the tires to cool down after being on the road. Remember that overinflating can be just as bad as underinflating. Overinflated tires can cause the tread to wear prematurely in the center of the tire due to the car's weight resting more on that part. This increases the odds of a blowout, especially if the tires get really hot, and overinflated tires don't grip the road as well, negatively affecting cornering and stopping. If you find you've overfilled your tires, simply let out the excess air with the small protrusion on the back of the head of the pressure gauge against the metal pin inside the tire's valve stem. Let out a little at a time and keep rechecking until the pressure is correct. Proper tire pressure is paramount for safety and fuel economy. For a free tire pressure check or regular vehicle maintenance, stop by Hye-Tech Auto at 1101 N. Azusa Ave. Unit B2 in Covina. Hye-Tech can be reached at (626) 332-5452.